According to ChemOrbis, polyolefin players in Europe just started to return from Christmas Holidays with the post-holiday scene pointing to a weak market trend region wide. The renewed decreases for January PP and PE prices were already widely expected given lower monomer settlements although decrease amounts are not matching monomer declines. In the PP market, most January offers emerged with €100/ton decreases from December while only a few prices were reported €110-120/ton lower. Converters elect to buy hand to mouth following the holidays since they expect additional discounts, albeit for slight amounts, citing the fact that most sellers have yet to concede to the full propylene contract drop so far. A converter in France reported that they have not accepted €100/ton reductions as further small discounts are possible if sellers are under sales pressure. A buyer in Italy also refused to pay €110/ton decreases from his regular West European suppliers. “We want to check the market to see if there are even lower prices. Prices may post further small losses during the month due to weak crude and naphtha markets,” he said. A distributor in Italy, meanwhile, offers January volumes with the full propylene drop of €120/ton, saying. “We hope to see some demand in the first half of the month before activity slows down later since players already expect further price cuts in February.” A local seller stated that they may revise their prices depending on the demand status soon, although they are offering €100/ton drops for now. In the PE market, distributors are offering January decreases changing between €70-130/ton nowadays while they admit that demand is very calm with only a few inquiries. A couple of sellers claimed that LDPE film saw more modest decreases due to relatively limited supply although no considerable concern was voiced amidst lethargic demand. Converters refrain from purchasing much PE as they expect to see refreshed drops next month. A buyer in Italy commented, “We want to get the full ethylene drop of €130/ton or even stronger discounts considering that in the last 2 months producers have not given the full monomer decreases. We will buy a small amount now as we foresee further decreases of up to €180/ton in February,” he noted. In the upstream chain, Brent crude oil futures retreated more than $5/barrel in a week while indicating a larger drop of around $14/barrel for the last one month as per ChemOrbis. 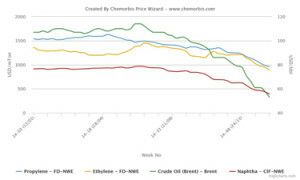 Lower energy costs pushed spot naphtha costs on a CIF NWE basis down by $40/ton on the week and $95/ton in a month. Spot ethylene prices added to their losses over the week as they decreased further by €50/ton. They also represented a €165/ton drop for the last one month. Prices for Brent crude oil, naphtha and ethylene in Europe have all sunk to the lowest levels of nearly 6 years, according to data from ChemOrbis Price Wizard.